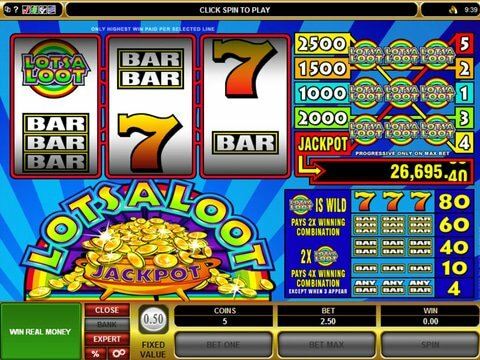 There are plenty of classic slots out there, but the LotsALoot 3 Reel slot machine is one of the most popular. It is incredibly simple with its three reels and five paylines, and the theme is one of rainbows and gold. You can review it right here on this page with the no registration, no download LotsALoot 3 Reel free play slot demo that is available on both your mobile phone and your computer. You can bet anything from a nickel to $2.50 per spin on this machine, and while the in-game jackpot is small at just 2500 coins, the progressive jackpot regularly tops out at more than $20,000. There are a couple of features here to help you out, and they both involve the LotsALoot Logo. It will act as a wild to substitute for all other icons, and it can double wins if one is used, but if two of them are used to create a winning combination, your prize is quadrupled. What's more, if the Logo appears all three times on the fifth payline, the jackpot is yours. There are no free spins or second-screen bonus rounds here, but the fact is that you shouldn't really expect them with a free three-reel slot. It's a fun way to pass the time, if nothing else as most older Microgaming slot games tend to be classics . Another classic that is better for folks who are ready to invest real money is the Gold Rush slot from Net Ent. This one offers up three reels and a single payline with a jackpot of $960, but the payouts are more frequent - especially with the Cherry that pays if only one lands on the payline. There's a progressive jackpot here, too, but it's paid out in excess of $200,000 in the past - and that's definitely something to look forward to.